Hagen used to produce a perfect water filter Fluval FX5, however the company has had a chance to improve it eventually and this is how a new filter Fluval FX6 appeared. This filter doesn’t differ significantly from its predecessor, but it has some essential features. Fluval FX6 – isn’t just a modified and improved version of already known and popular filter, as it is a more adaptive and upgraded product. 1 What do they have in common? 2 What are the differences between these two filters? In fact Fluval FX6 is quite the same as Fluval FX5 as for both its overall size and internal construction. The filter is made for tanks of about 1500 liters capacity (400 US Gallons). This filter has the same multistage filtration system consisting of 3 dismantling built in section containers and filtering rings. The filter functioning is provided by a smart pump technology managed by the electronic chip that continuously controls the device state and functioning, it measures water flow rate and in case of necessity removes the air that may get into the system when running the filter as well as it does it later each 24 hours while the filter works. 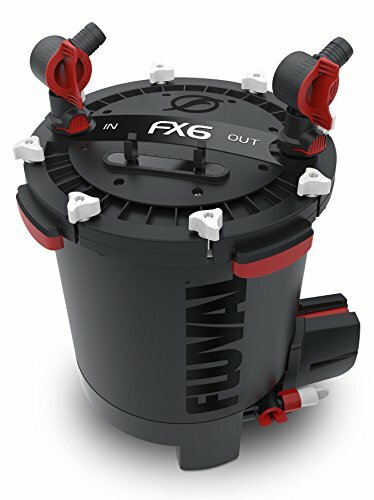 Fluval FX6 is a self-starting filter equipped with a reliable system AquaStop and it has the same multifunctional mounting system that makes the filter easy both in assembly and operation. The filter is a maintenance-friendly and easy to wash one due to its modular build and the presence of a blow down valve. The total height of the filter is 54 cm. What are the differences between these two filters? First of all we should mention that Fluval FX6 has become 10% more energy-efficient in comparison with its predecessor. Fluval FX6 unlike Fluval FX5 has Biomax filtration filler available in the set, which is also a significant plus. Fluval FX6 performance was decreased from 2300 liter/hour to 2130 liter/hour. It is supposed to be the optimal rate of water circulation that can only improve water filtration. At least there is no way the quality of filtered water gets poor due to this. Filter upper lid clips were changed to provide its firm fitting against the pressure to the filter body and to make it more convenient. The lid itself now has 2 spinning blocks with 12 sections on graduated scale which were made for making marks and reminders as for the tank and filter maintenance preformed. Now you can make a mark on a filter to notify when you renewed tank water or maintained your FX6 filter last time. So, we’ve looked through what the manufactured says as for the filter and now we’ll share our opinion about this filter type. Well, as for the packaging – it is durable although there’s no foam plastic in it, but the filter body is constructed so that even if you use the box to play football, it won’t do any harm to the filter. The plastic of the filter body is quite soft, but with no sign of fragility, which is good. The packaging has quite informative marking on it, which gives the buyer enough information to decide as for the filter parameters. The filter itself, instructions, hoses and all necessary stuff to run the filter. Fillers: Foam Filter Pads, Bio-Foam Pad and Bio Rings. 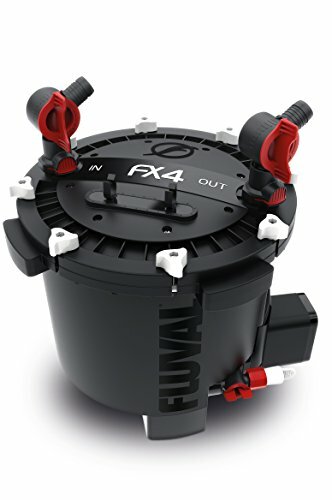 Fluval FX-6 significantly differs from all the others, namely the location of its pump under and from outside the filter makes it different – the pump is outside the filter body. Such a location has both pluses and minuses, see the details below. Another thing that makes this filter different is its upper lid fastener system, namely there are 6 clips that tightly press the lid to the filter body and they are very easy-to-use. There are now 2 elements with 12 sections on the filter where one can see maintenance reminders – the date of last maintenance operations and water renew performed. Therefore, using this new feature you can write there down the date of last maintenance and tank water renew. These characteristics are given by the manufacturer, although there are some rather well-grounded doubts as for its pump output. *NOTE: the data was measured using inlet and outlet hoses of the same length and without any fillers. With fillers placed into 3 containers right after starting running the filter demonstrated flow rate 1820 liter/hour. It wasn’t a problem to start the filter when following the instruction. Once you’ve read it, everything is clear. If something remains unclear you can always watch youtube and it gets plain and simple. If you have already had some experience with external filters, then the main thing about this filter is to remember that it’s CRUCIAL to pour about 8-10 liters of water into it before starting, otherwise it won’t start and also the pump may burn down. It’s more convenient to pour water into the filter when it’s open at the stage of instillation of containers with fillers. The peculiarity is that: filter’s hose is a thick one, that’s why it’s necessary to foresee some airspace between the wall and the tank to avoid the situation when you can’t take the hose between the tank glass and the wall. One of really brilliant innovations brought into FLUVAL FX-6 work is to stop its functioning once a day for several minutes, during this stoppage all the air that has been accumulated during the day gathers under the filter lid and at the moment the filter starts the air is ejected into the tank through the hose. Previous models of fluval filters had a very serious problem of airlocking in them. You can see in the video how the air is being ejected by the filter after its regular restart. Another advantage of this filter is that the pump is always filled with water so it’ll never run idle, i.e. water bubbles which inevitably get into the filter won’t lead to noisiness increase or even filter breakage in case of large content of air in it. This point is quite important since one of my filters, namely Fluval 305, was prone to such a “disease” and it always got filled with air. Once the consequences of this issue were rather serious, so I had to replace the impellor and its lid, since I failed to notice timely the excess of accumulated air in it and I didn’t drop it out. There’s only one drawback of such location of the filter pump – there is nothing between the pump and outside, which means that the filter noisiness will increase a bit, that’s why FX-6 is quite noisy. The filter noisiness level can be compared with the noise of a computer system unit, from one hand it’s not very noisy, but from the other – I won’t recommend to have this filter in a bedroom for example. Although the additional sound dumping of the filter table may settle the matter. I really wasn’t disturbed by the filter noise, since my tank is in a separate room. Pumping/output measurements were performed a week later after the filter was installed and we obtained output equal to 1820 liters while filter was completely filled with fillers. Taking into account that my tank is of 240 lites capacity, I must say that pumping of about 2 tons of water with huge number of filtering materials provided me with a crystal clear water, though at the beginning the filter used to take a lot of mud up from the tank bottom (the water flow must have shown). The filter power consumption is 43 W, which is 10% less than FX5 has. From one hand it’s not that much, but from the other – there’s almost alike filter EHEIM professional 3 2080, which stated water circulation rate through the filter is 1700 liter/hour and it consumes only 30 W, so it means that FX6 is not an energy-efficient one and we have the next point resulting from this. The more power any electric equipment consumes, the more heat it produces, therefore it means that in summer when it’s boiling, FX6 users will have their tanks 20 W more heated, then EHEIM professional 3 2080 users. When the filter got to the test bench, one of the main aspects was to make sure that there should be 10 pumping volumes in planted tank. So, as it was planned the filter was mounted on a new tank (after total renew), at the beginning the filter successfully dealt with mud in the water and some beard algae present on the snugs – it was gone. While putting more plants into the tank and when cutting them it was noticed that the plants state is good both inside the whole bunch and outside it, i.e. there is also active water circulation even there. Next – due to some reasons the tank plants weren’t cut for a long time and because of this the bottom plants were left almost without any light, however their state didn’t get worse, they elongated a bit, but they were ok, so the absence of “dead spots” and efficient water flow helped the plants feel fine and they didn’t die in really extreme conditions. During any pre-arranged water renew in a tank it’s enough to switch off the filter, release the drain tap and put a hose on it in advance, then pour off the required amount of water. It’s quite more convenient then to pour off the water over the tank edge and also there are no water drops on the tank glass. HAGEN engineers did their best in this respect, since FX-6 is quite heavy and has rather large volume, so with water inside the filter weighs about 65 pounds (30 kiloes), i.e. it’s rather massive. That’s why the manufacturer has foreseen the way to pour off water from the filter before taking it for maintenance. You have to release IN and OUT taps by just shutting and clicking them off, then pour off the filter contents through the drain tap. Then perform the maintenance activities when the filter is empty. However in case when the filter is on the floor, you won’t be able to pour off all the water from it. Lid locking mechanism is also convenient – unlock 8 clips and the lid is up, the only thing that confused me was that you have to tighten the lid till the time it touches the filter body, but I was confused how tight should I close the lid until I read about this in the instruction. Another convenient option is the presence of T-shape handles to gather the containers into the block to install or remove them from the filter. This filter has given a good account of itself in the thickly planted tank of 65 gallons (240 liters) capacity, though when using the filter in a standard tank the capacity of the latter may surely be increased twice or three times. The filter has enough power to do with it. The forethought and convenience of the filter maintenance have also become a good surprise, since taking into account FLUVAL FX-6 size it’s amazingly easy to perform maintenance activities even for a kid. As for the filter price – well, if we proceed from quality-to-price ratio then this filter is the premier choice, but in the case when its power consumption won’t be a holding factor.